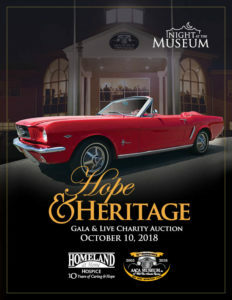 Join Homeland Hospice and the original Ford Mustang designer for a Night at the Museum. The designer of the original 1965 Ford Mustang will receive the AACA Museum, Inc. Automotive Heritage Award during the Museum’s annual gala fundraiser on October 10 benefiting Homeland Hospice and the AACA Museum, Inc.
Award recipient Gale Halderman began as a designer with Lincoln-Mercury in 1954 and four years later became head of Ford’s Advanced Studio. In addition to leading the team that created the first Mustang, during his eight years as studio chief, Halderman oversaw the development of the Lincoln Mark VII and VIII. The AACA Museum, Inc.’s “Night at the Museum Gala” will be held from 5-10 p.m. on Wednesday, October 10 (Hershey, PA) and includes a cocktail reception and full dinner. UPMC Pinnacle is the Premier Sponsor and presenting sponsor is PNC. Tickets are $150 and proceeds will help support benevolent care provided by Homeland Hospice as well as the AACA Museum’s continuing preservation work. Guests can meet in a special VIP setting for a $50 upgrade featuring a private exclusive reception with Gale Halderman. VIP Guests will also receive an autographed Mustang poster courtesy of Ford Motor Company. The AACA Museum, Inc. will hold a live auction with auctioneer Josh Katz of the Katz Family Foundation during the Gala, which also marks the 15th anniversary of the Museum. Many interesting auction items including artwork and special experiences – ones you cannot buy anywhere else – will be up for bid. During the event, visitors will have the opportunity to tour the museum’s featured exhibits including “Mustangs: Six Generations of America’s Favorite Pony Car,’’ with more than two dozen Mustangs, a trio of Thunderbirds courtesy of the International Thunderbird Clubm and the 1985 Modena Spyder aka the “Ferrari” from the movie Ferris Bueller’s Day Off.